Beetroot powder may seem a bit 'out there' and unnecessary for the home cook but it has some great uses and lasts a very long time. I add it to my home made kombucha and raspberry smoothies to make them look Barbie pink. Great for Instagram but also great for kids. One of my clients had a young boy who hated anything healthy but he adored my raspberry and ginger kombucha. The bright colour fools kids into thinking they are having something naughty. 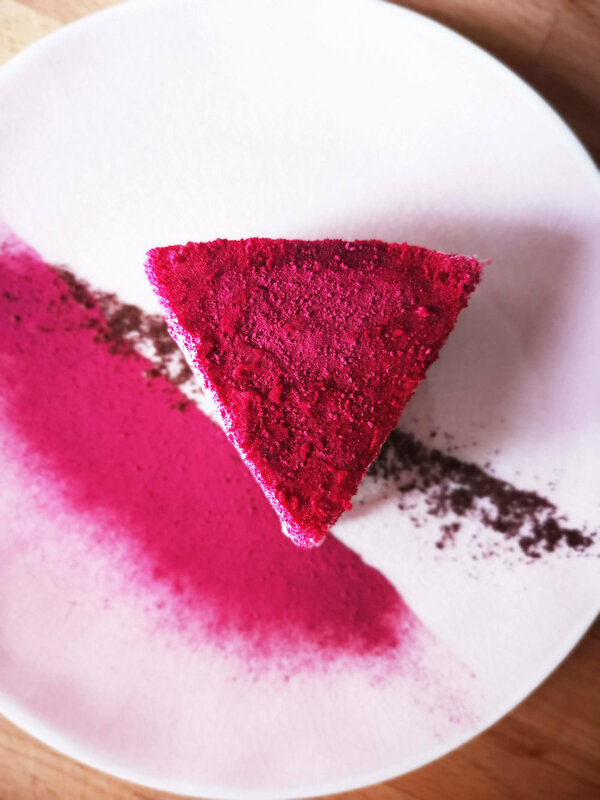 Beetroot powder is also fabulous at lifting desserts, sprinkle it on through a fine sieve so you have a gentle dusting or throw it at an angle for a more painterly effect. I bought my beetroot powder from Amazon, a whole kilo of it! Put boiling water into a large bowl, set a smaller bowl on top just touching the water, melt the chocolate in this bowl and then add the ground almond, mix well. Put this into the base of your moulds and pat down with the back of a small spoon. I used a triangular food mould sat on top of a small piece of baking paper on a plate. Chill this in the fridge while you make the cream. Melt the coconut oil using the method used for the chocolate. Blend the oil with the milk, cardamom, cheese and sugar. Pour it into your moulds. Drop the raspberries into the moulds and pinches of beetroot powder. Swirl the powder into the cream using a toothpick or similar. Freeze for around 1 hour but no more than 4. If you do have to leave it longer remove it from the freezer at least 10 minutes before you want to eat it. Use a knife to loosen the cheesecake from the mould. Decorate the plates with beetroot powder, I also used coffee grounds but that is optional. The bitterness does counter balance the sweetness of the dessert but I know it's not to everyone's liking. Put the cheesecakes on a sheet of baking paper and dust with beetroot powder. Place carefully on the plates using a spatula.